Distinctive flowers and sweet scent. A must-have for any garden! Flower displays from February to April. Perfect for pots, containers, or straight in the ground! Will grow to 30cm (12 inches) tall. Daffodils blowing in the breeze are a true sign that spring is approaching! Heralding the arrival of spring, these bright bloomers are a must for everyone, with flowers from February until April. They are perfect for pots, planters, beds and borders, and will also make wonderful cut flower displays! Leave the bulbs in the ground after the flowers have died back, and they'll reward you with bigger, better displays, each year for many years to come. 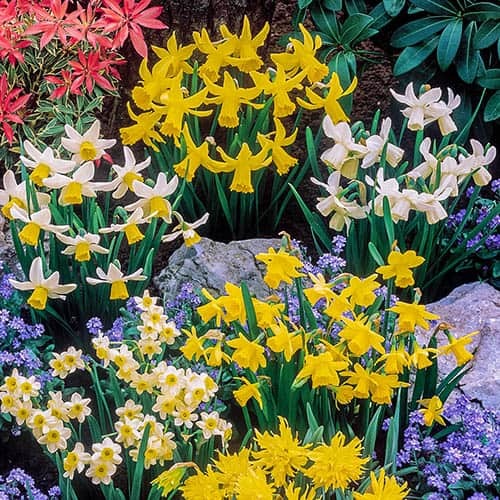 Supplied as a pack of 100 bulbs, in mixed varieties.